Christopher Carelli: Is MLB's wild card structure accomplishing its goal? Is MLB's wild card structure accomplishing its goal? As part of the latest collective bargaining agreement, Major League Baseball introduced a new playoff format which went immediately into effect for the 2012 season. The intention was to try and get more teams a chance to reach the postseason and make the final two months of the regular season more interesting for as many teams as possible. The "winners" of each wild card slot play each other in a one-game playoff with the winner earning a meeting with the league's leader in wins in a best-of-five series. Since we are a little over one week away from the non-waiver trading deadline, it is a good time to start looking ahead to see which teams have a shot of making the playoffs under the new structure. At that point we can answer whether this new scenario is accomplishing what the leadership of MLB hoped. Above are the standings after games played on July 22, 2011 and July 22, 2012 respectively. I included any team within at least 10 games of the last wild card spot. In 2012, the games back column refers to the number of games back of the second wild card team, so the Dodgers are one-half game back of Atlanta, who trails Pittsburgh by two games overall. In the American League, the Angels and Orioles have exact 51-44 records. The teams involved are not of my concern, but the number of teams is. 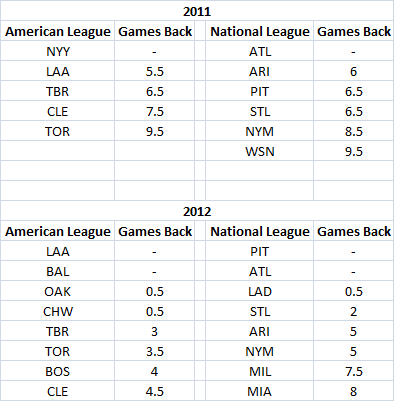 You'll notice right away that there are three more teams in the American League and two more teams in the National League within at least ten games of one of the spots compared with 2011 due to the new rules. Better yet, four teams in the American League are separated by only one-half game. Does this tell the entire story? It may. It may not, depending on who you ask. In a literal sense there are more teams "with a shot", so MLB is getting what it wants. On the other hand, upon further review of the records of the teams "in the mix" and review the true context of the change, we see a reality that things are not so much different, if at all. In the National League, this is especially true. While the Arizona Diamondbacks are five games out of the wild card spot, they are one game under .500. Milwaukee is six games under .500 and the Miami Marlins have lost seven more games than they have won. Is this sparking interest or bringing false hope? Another scrutiny of the new format is that if the old rules were in effect (one wild card team per league), then all the same teams would be in virtually the same boat and all would still be within ten games of making the playoffs. Further, isn't it just as exciting to have a one-game playoff to be only wild card team? That would happen in the American League using last year's scenario if the season ended after yesterday's games. Yes, as of today, the new format gives more teams a "chance" at reaching the postseason than last year, but the same number of teams would be questioning their position under last season's rule so in essence the change has done little. On top of that, how many of those teams have realistic shots? Some of the teams in the hunt have yet to decide whether they are buyers or sellers at the trade deadline, possibly due to a false sense of hope. There will be at least a couple teams on the chart that will become sellers because they are not fooled by the smoke and mirrors of the new format. I think parity around MLB combined with weak teams outside the top few of each league has attributed to the number of teams within "striking distance" of the wild card slots, not the new format. The new scenario has a chance to water down what it takes to fight for a playoff berth; a better than average team. Wouldn't you rather see two leagues with no divisions and a completely balanced schedule, rewarding the top four teams in each league with a playoff berth? I know I would, but that's a discussion for another day. Please follow me on Twitter @Chris_Carelli.